One of the most poignant stories I have of dealing with “the elephant in the room” is not business related, but one that really demonstrates that if you can cling onto your integrity, in the face of even the deepest adversity, then out of something bad will come something good. The story relates to a girlfriend of mine who had just come through an exceptionally acrimonious divorce. Just days after the final divorce hearing, and after three years of intensive marketing of her martial home, she received an offer on her house She was delighted not only because it would signal the end of an unpleasant era in her life, but also because sh e simply could not afford to keep the house, which was already under threat of repossession. With renewed vigor she contacted her solicitor who promptly told her that as attractive as the buyers offer was, that she was unable to sell her home without the potential of a challenge from her ex-husband, as the divorce settlement had been based on her remaining in the former marital home with her children. This, her solicitor informed her, she would be obliged to do for a minimum of six months to avert such a challenge. She was beside herself with the worry and the thought of losing her buyer after three years of trying to sell her house in a depressed and falling market. At this point my friend sought my advice. My advice to her was that was to deal with “the elephant in the room”, she was more than likely going to lose her buyer anyway, and so why lie about the situation I told her. I suggested that she contact her buyer and invite them over for tea and a chat. She asked me to join her. On behalf of my distraught friend I explained the situation to the intrigued buyers, who, as I unravelled the story started to smile. They were extremely sympathetic. As the conversation evolved it transpired they were buying my friend’s house as their first home together. They too had been through divorces and said that they ‘understood the awful procedural processes’ and the limitations that individual settlements can place on divorcees. Then, completely unexpectedly the dealing with “the elephant in the room” and its honesty pay-back was delivered! The woman said that she really wanted the house. The man took a moment to digest all that had been said before announcing that they were renting at the present time and that he would be prepared to rent for a further six months if my friend agreed to take the house off the market, and sell it to them at the same price. His only concern was that his mortgage offer would run out, but that he would deal with this. The story has a happy ending as contracts have been exchanged and both parties are now living happily in their respective new homes. My friend, by her own admission, is not necessarily the best communicator and she readily acknowledges that she would have accepted her fate of loosing her buyer. As I have said to her since there is a real and valuable lesson to be learnt from this, not only in terms of effective communication skills, but also in the power of being honest. Being honest and equally important dealing with “The elephant in the room”; the chances of my friend having a successful outcome without firstly being honest and secondly dealing with ‘the elephant in the room’ were very slim indeed. A real life’s lesson was learnt that day. 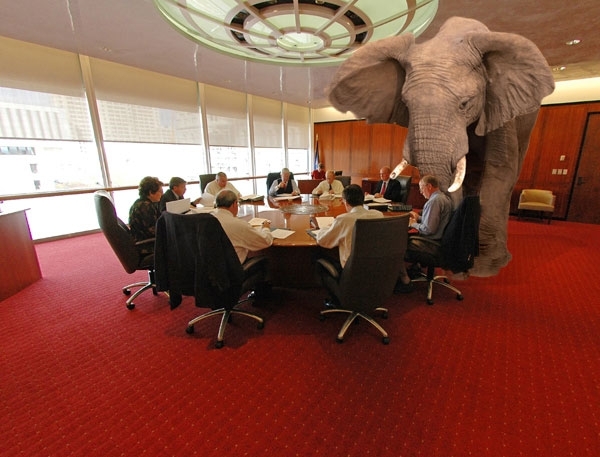 “Elephant in the room” is an idiom for an obvious truth that is being ignored or goes un-addressed. The idiomatic expression also applies to an obvious problem or risk no one wants to discuss. It is based on the idea that an elephant in a room would be impossible to overlook; thus, people in the room who pretend the elephant is not there have chosen to avoid dealing with the looming big issue. This was so obvious to me in my friend’s case. Few phrases evoke such perfect imagery as “the elephant in the room.” What could better represent something in a room that you can’t help but notice than a six-ton-plus animal? How could you not talk about something like that? The more we encourage people to give honest opinions, and deal with “the elephant in the room”, the more likely it is that accuracy and trust will increase and relationships, personal, business or otherwise, will deepen.